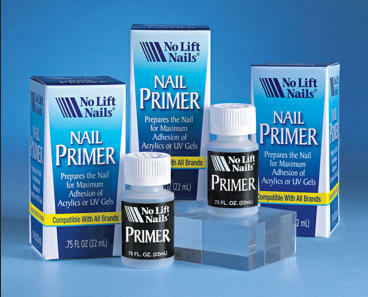 No Lift Nails Primer is the best acrylic nail primer available for the prevention of lifting. When we started 35 years ago we were the first full strength nail primer on the market. The nail technicians found that by using this primer they only had to remove the shine of the natural nail and that the acrylic nail stayed on for up to three weeks without lifting. No Lift Nails Primer prevents nail lifting and does not require clipping around the cuticle before filling. Works with all Acrylic Nail Products NEW LARGER 3/4 OZ. SIZE! - 50% More Nail Primer • Our nail primer is compatible with any acrylic system • No other steps or preparations are needed with our nail primer • Chemically prepares the nail for acceptance of the acrylic • No Lift Nails Primer is guaranteed! • No MMA! • Works Great with UV Gels! When the U.V. Gels came on the market they used the No Lift Nails Primer with the same results, maximum adhesion for U.V. Gels. A Super Dehydrator that eliminates moisture and prepares the nail for the adhesion of any acrylic or UV Gel. The No Lift Nails primer is responsible for the success of thousands of nail technicians building their clientele and keeping it strong.